Our society is in the midst of an emotional meltdown. People are restless, volatile, their tempers about to blow. A recent Gallup poll reported that motorists are more concerned about road rage than drunk driving. Thirty-five million people have been prescribed Prozac in the last decade. The World Health Organization predicts that twenty years from now, depression will be the second leading cause of death. We deserve relief. In this live lecture, Dr. Orloff presents you with new solutions for dealing with emotions because conventional coping mechanisms just aren’t holding up in our hyper-tense world. 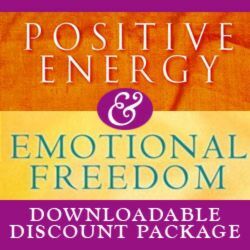 You’ll learn the 4 components of Emotional Freedom: its biology, spirituality, energy, and psychology. You’ll see how learning to work with negative emotions, rather than collapsing into them, helps you spiritually grow. In this informative, lively video, Dr. Judith Orloff, author of Guide to Intuitive Healing, share the five steps to intuitive decision making that she uses in her medical practice so everyone can learn them too. Dr. Orloff presents a revolutionary argument for the integration of intuition with classical forms of Western medicine. She passionately believes that the future of medicine lies in the “the wedding of heart and mind.” In her vigorous and caring voice, Dr. Orloff explains how intuition can be used to listen to our body’s signals to make better decisions. This groundbreaking video, geared to health-care professionals and general audiences alike, legitimizes intuition as a dynamic therapeutic tool. Are You Involved With An Emotional Vampire? You possess an innate intuitive intelligence so powerful that it can tell you how to heal and prevent illness. Judith Orloff, MD, a pioneer in the new field of Energy Psychiatry, shows how to reclaim this intelligence. She passionately believes that the future of medicine lies in using intuition to access your body’s subtle energies for greater wellness. This sacred energy is with you at birth, throughout life, and continues after death – a marker of your soul’s journey. You can learn to draw upon it. Do you listen to your gut feelings about people, to attract healthy relationships and avoid draining ones? Do you heed your body’s early warning signs such as fatigue, to take care of your health? Do you act on what moves and inspires you, rather than making decisions solely on paper? Do you pay attention to vibes that people give off, positive and negative? Do you listen to the wisdom of your dreams? Do you know how access the intuitive wisdom of dreams?